Our very first graduates: Zanne, Tom, Jo and Suzannah. 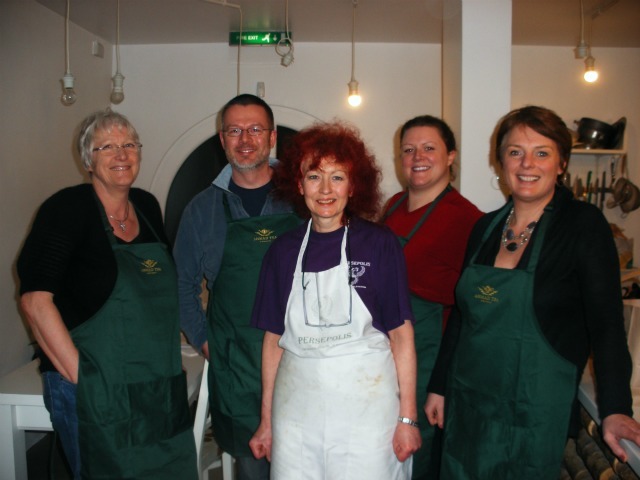 Last night saw the inaugural Persepolis Cookery School, at Anderson & Co. in Bellenden Road. What do you mean you didn’t know about it? It’s been on our website, Twitter feed and Facebook page for a while now – and in the newsletter. Pay attention! It was billed as a ‘masterclass’ – but that tag is far too grand for wee cornershopkeepers. It was, rather, a chance for our first ever ‘students’ to get a close look at what really goes on in the Persian kitchen. To laugh at how very clumsy Mrs. Shopkeeper is. To ask as many questions as they like. To try their hands at making some of the stuff that was on the menu. And, most importantly, to sample some of the fare. It was a chance for us to cook stuff the way it ought to be cooked (without cheating andusing a rice cooker etc), to meet some really nice people who (astonishingly) seemed really interested in what we had to say, to show off a bit (we’re always nothing if not honest), and to have a night off shopkeeping. In the four hours that the class lasted we made ash reshteh (which is always the mark of a good Persian chef – the Farsi word for chef is ashpas, or soup-maker), kookoo sabzi (posh omelette), bogoli pulao (broad bean rice) with ab-gusht (chickeny citrussy stock), dolmeh (stuffed aubergines and vine leaves) and sholeh zard (saffron rice pudding). By the end of it we were all very hungry…so we sat down and ate it. The bits that didn’t get eaten got bundled up as take out for those left behind. Participants got an apron, a souvenir 8-page booklet with the recipes featured, and, most excitingly, a really amateurish little certificate. A great night Sally, thank you. Cooking demos delivered in a relaxed informal way. Felt like I picked up loads of good tips. Most importantly, the food tasted fantastic, and a real treat to take so much of it home as a take away. Really recommend the course. I felt I was very lucky to four such lovely and attentive people in the first class. Would it be possible to have a cookery class for 3 people on Iranian vegetarian food on 3.3.14? Thanks for your comment. There is actually a course on veggie Middle Eastern food nest Sunday 23rd February, and there is a Persian Master class (mixed, not entirely veggie) on 9th March. If you wait a few weeks I will post the course details on our website.